California Department of Food and Agriculture and the University of California, Davis Center for Watershed Sciences provides a glimpse of the consequences of water supply shortages for the state of California. Mike Wade, California Farm Water Coalition Executive Director, said these effects will be felt as escalating unemployment, substantial economic loss and ongoing future water supply shortages. Updating the previous report, researchers underscored the importance of having sufficient surface water deliveries to replenish the groundwater being utilized by farmers to survive this unprecedented drought. Increases in estimates of drought-related unemployment bring levels to approximately 2.5 times those experienced in the drought of 2009. The report also raised estimated state economic losses to more than $2.2 billion in 2014 alone. According to the report, impacts will be primarily focused in some of the state’s most vulnerable regions, particularly those areas serviced by the Central Valley Project – which includes the Friant Division, which for the first time has a zero water allocation this year – and the State Water Project. The report also warns that there is a better than 50% chance that water supply shortages may continue into 2015, regardless of potential El Niño weather events over the coming winter. Farmers are being forced to dip into groundwater reserves for survival, as well as turning to water transfers. Wade added that many growers “have also turned to water markets to purchase available water. This water is coming at prices that are climbing toward $2,000 per acre-foot; instead of the normal $100-200 per acre-foot cost. California Farm Bureau Federation President Paul Wenger said the report underscores the need for the state to take swift, decisive action to address its long-term water problems. “One of the saddest things about the losses caused by the drought is that they could have been prevented,” Wenger said. “California has spent 35 years pursuing a conservation-only strategy that has proven disastrous. When we last built a new reservoir to capture rain or snowmelt, in the late 1970s, California’s population was 23 million. Now, we have more than 38 million residents, on the way to 44.3 million by 2030. “We must build additional and expanded water storage if we are going to be prepared to handle drought periods, to accommodate population growth and capture the warmer, flashier storm runoff linked to climate change,” he said. UC Davis officials said the drought is the third most severe on record and is responsible for the greatest water loss ever seen in California agriculture. Groundwater pumping is replacing most river water losses with some areas more than doubling their pumping rate over the previous year, the study said. “California’s agricultural economy overall is doing remarkably well, thanks mostly to groundwater reserves,” said Jay Lund, a co-author of the study and Center for Watershed Sciences Director. 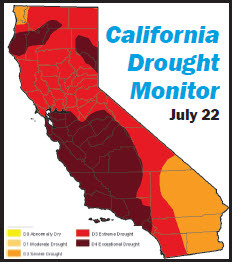 The report says 428,000 acres, or 5%, of irrigated cropland is going out of production in the Central Valley, Central Coast and Southern California due to the drought. The San Joaquin Valley is hardest hit, particularly in the Tulare Basin. The study projects losses of $810 million, or 2.3%, in crop revenue; $203 million in dairy and livestock value; and $453 million in additional well-pumping costs. 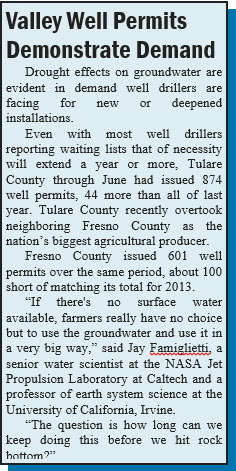 Groundwater overdraft is expected to cause additional wells in the Tulare Basin to run dry if the drought continues. Researchers say immediate relief is unlikely. The drought is likely to continue through 2015, regardless of El Niño conditions, the study says.